Los Angeles, CA, USA (August 5, 2015) — Thinkwell Group, a global experience design and production agency specializing in the creation of theme parks, major attractions, live events, and museum exhibits around the world, today announced its role in designing and producing a new addition to the Warner Bros. Studio Tour Hollywood. The 25,000-square-foot facility, called Stage 48: Script to Screen, is featured as the finale of the backlot tour and is the culmination of a two-year project that takes visitors behind the scenes of how movies and TV shows are made. The immersive attraction provides visitors with a hands-on introduction to the world of filmmaking and includes interactive features and exhibits that highlight the phases of the production process, from screenwriting and set design to visual effects and post-production. Visitors will not only be able to see authentic costumes, sets, and models from films like The Dark Knight, Corpse Bride, and Sweeny Todd: The Demon Barber of Fleet Street, they’ll also be able to interact with various elements that explore and explain the production process from start to finish. “It has been a real privilege to collaborate with the Warner Bros. family to make Stage 48: Script to Screen a reality. This was a top-down effort, with an amazing amount of participation and attention from the Studio Executives, Heads of Departments, and the Archive team. 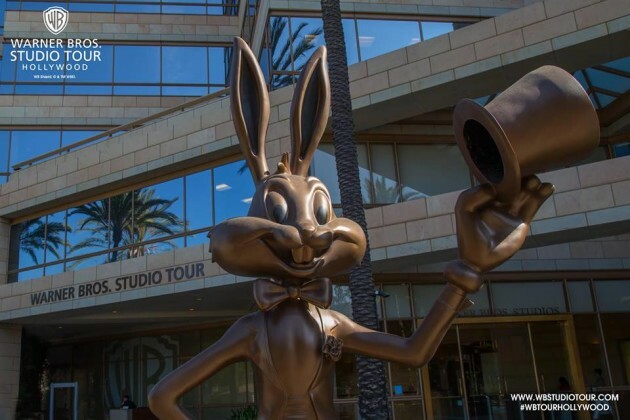 The Warner Bros. tour has been providing its visitors with an unparalleled experience inside one of Hollywood’s most storied studios, and Stage 48 is a wonderful finale and a clear demonstration of the studio’s commitment to their guests,” says Chris Durmick, Thinkwell Creative Director for Stage 48. Visitors are welcomed to the new attraction by Ellen DeGeneres in an introductory video after which they are able to walk through a series of displays that show the various stages of pre-production. From script writing to casting, visitors can view re-creations of what a screenwriter’s desk would look like, try casting a film at an interactive touch table, and see actual scaled models of film set pieces and costumes created by design departments. Visitors can also design their own Batmobile on an interactive design station as well as outfit computer-generated models in costumes from The Great Gatsby or Camelot. Visitors then walk through to the production area which houses the original Central Perk Café set from Friends, where visitors can act out a scene on the famous couch, get behind the camera, or be a member of the studio audience. This area also includes the space capsule used in the film Gravity. In the post-production area, visitors can see how special effects, sound design, and editing complete the Hollywood magic. Visitors can experience green screen technology and ride a Batpod through the streets of Gotham, act as Dobby from the Harry Potter films using motion capture technology, or portray a larger-than-life Gandalf from The Hobbit at a forced perspective table. At the end of the exhibit, visitors can experience the history of Warner Bros. in the Legacy Room, which includes some of Jack Warner’s personal effects and features a collection of Oscars and Emmys the studio has received in its almost 100-year history. There is also an almost 180-degree projection screen that shows a compilation of clips from award-winning movies like Casablanca, Driving Miss Daisy, to television programs like The Waltons, and Roots. Opened on July 16th, Stage 48: Script to Screen includes a new Central Perk Café and a retail store and is the finale to the existing studio tour that will allow visitors to go even further behind the scenes of the television and film world to get a true insider’s view into the workings of actual Hollywood productions.